Does you Air Handler sweat and constantly dripping water into the auxiliary pan? Is your ductwork sweating, causing damage and mold? 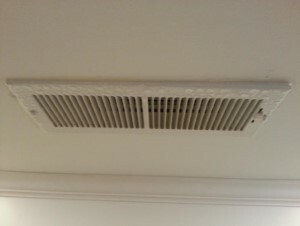 Do your AC vents constantly have condensation on them? Unchecked, the condensation forming on your air handler and ductwork may cause mold to flourish. Condensation forming on AC registers may be an indication of a much more significant issue – a lack of general humidity control that can result in widespread mold development. Condensation is often a combination of building-related issues and HVAC-related issues. In many cases, HVAC companies lack the general building science knowledge that is necessary to properly inspect and evaluate the problem. GLS Engineering has extensive experience with HVAC-related moisture and building science, allowing us to properly diagnose the problem and develop a realistic solution. If you are looking for HVAC Condensation Investigation services in Charleston, call GLS Engineering at 843-881-4803, or fill out our online request form.